In a medium bowl, whisk together honey, cilantro, oil, mint, rum, and lime juice and zest until well combined. Add shrimp, coat well, and cover with plastic wrap and place in refrigerator for at least 24 hours, but no longer than 36. The shrimp should begin to look opaque and no longer raw. Drain the liquid from shrimp, and cut each into 4 equal pieces. To make the cocktail, place cut shrimp into a clean dish with the mint, rum, lime zest, and juice. In a small sauce pot, make simple syrup: heat sugar, corn syrup, wasabi, and water and bring to a boil. Put liquid in the refrigerator or in an ice bath to chill. In blender, combine the simple syrup with remaining ingredients and purée until smooth. Put into an ice cream maker and follow manufacturer’s directions. Reserve for service. Combine all the tomato salsa ingredients in a bowl, season with salt and pepper, and reserve for service. Since it is a cocktail, you’ll want to use martini glasses or other festive dishes for this. 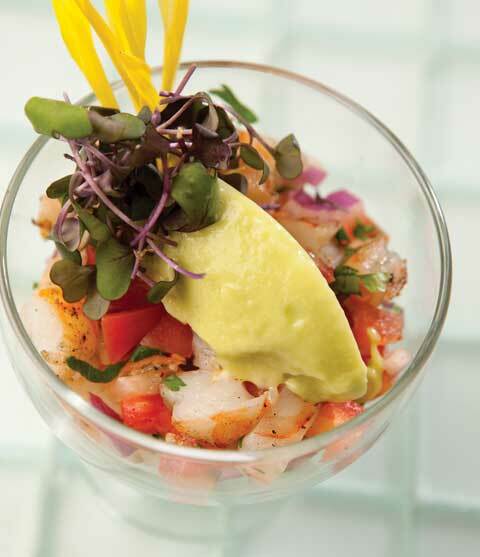 Place about 1 cup of the shrimp mojito mixture in a glass, then top with 1 tablespoon of the salsa and 1/4 cup of the sorbet.